The main difference between sociology and psychology is that the sociology is the scientific study of human societies and their cultures whereas the psychology is the scientific study of the human mind and behaviour. Psychology and sociology are two different fields. In some ways, these two fields go hand in hand for discovering the scientific truth about humans. Nevertheless, due to their slightly similar pronunciation and similarity in their objective, some people get confused whether these two disciplines mean the same thing. To define sociology briefly, it is the scientific study of the development, structure, and functioning of human society. Hence, it is the study of human interactions with others on a societal level and their relationships with social institutions. Therefore, the scope of sociology varies from family, state, race and social divisions, religion and beliefs as well as cultures. Eventually, sociology analyses the way how these social associations and interactions can influence forming a stable society, overcoming extreme impacts such as radical changes and crimes. Some major theoretical approaches in sociology are functionalism, conflict theory, structuralism, utilitarianism, etc. Sociology looks beyond individual beings to examine society as a whole through specific social associations. 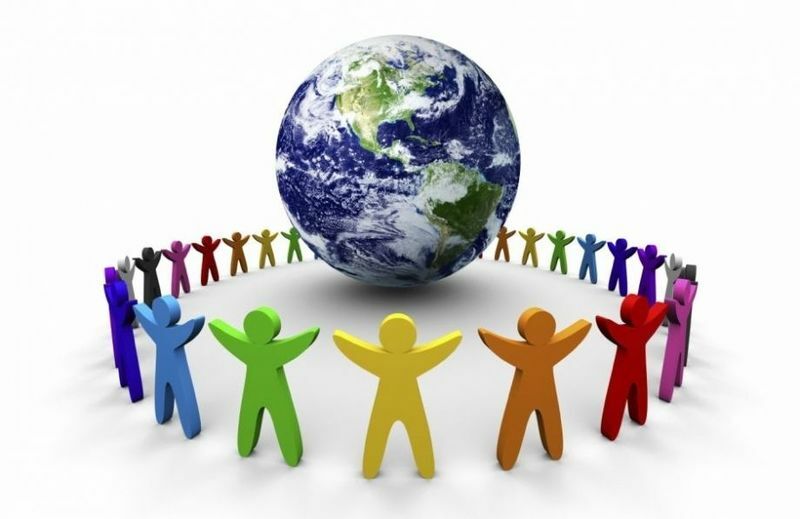 Likewise, sociology becomes the best choice for someone who is interested in researching how these human societies develop and finding ways to develop and organize the societies from its root level. The career options for sociology includes varied sectors from the research sector, administrative sector, public and welfare sector, business sector, as well as the education sector. Some careers such as social researchers, caseworkers, paralegals, public relations workers, administrators, community organizers, public policy researchers, and data analysts are related to sociology. Psychology, by definition, is the scientific study of human mind and its functions, specifically those that affect human behaviour. It also studies the processes and complexities in the human mind that influences the proper maintenance of mental health and well-being. Thus, unlike sociology, the focus of psychology is on the individual level. Likewise, psychology amalgamates varied subject matters from societal aspects to neuroscience. Similarly, there are different types of psychology such as cognitive, forensic, social, and developmental psychology. Modern psychology is an evolution of the early psycho-analytics and perceptions provided by great personalities such as Lord Buddha, Socrates, Plato to contemporaries such as Sigmund Freud, William Wundt, William James, etc. Accordingly, the subject of psychology mainly consists of several major schools of thought. However, functionalism (by William James) and structuralism (by William Wundt) dominate as the main two schools of thought. Hence, psychology is the best option for someone who is interested in studying specific mental and behavioural reactions. These typically include careers such as psychologists, psychology researchers, counseller, educational psychologists, school psychologists, forensic and clinical psychologists, etc. 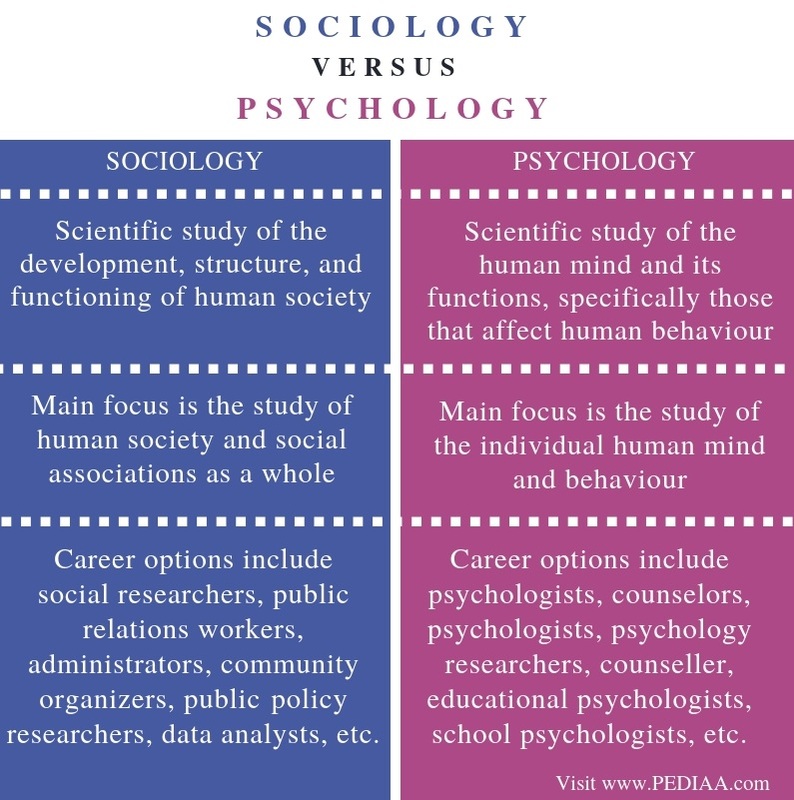 Sociology and psychology study human qualities and interactions at different levels; sociology from a social level while psychology at an individual level. Both sociology and psychology consist of major theoretical approaches such as functionalism and structuralism though they emphasize on different human levels; societal level and individual. Sociology is the scientific study of the development, structure, and functioning of human society. On the other hand, psychology is the scientific study of the human mind and its functions, specifically those that affect human behaviour. Thus, this is the main difference between sociology and psychology. The main focus in sociology is the study of human society and social associations as a whole while the main focus in psychology is the study of the individual human mind and behaviour. Career options for those who are specializing in sociology include social researchers, caseworkers, public relations workers, administrators, community organizers, public policy researchers, data analysts, etc. However, career options for those who are specializing in psychology include psychologists, counselors, psychologists, psychology researchers, counseller, educational psychologists, school psychologists, forensic and clinical psychologists, etc. Hence, this is another difference between sociology and psychology. Psychology and sociology are diverse subject matters that study humans on different levels. Thus, the main difference between sociology and psychology is that sociology is the scientific study of human societies and their cultures whereas psychology is the scientific study of the human mind and behaviour. 1. “What Is Sociology?” Department of Sociology, University of North Carolina, Department of Sociology, University of North Carolina, Available here. 2. “What Is Sociology?” American Sociological Association, 23 May 2016, Available here. 3. “What Is Psychology?” Psychology Degrees, Available here. 4. “What Is Psychology?” Department of Psychology, Available here. 5. “Career Opportunities.” Sociology.unc.edu, Available here.